Sebelum menjelaskan fungsi dari WinToFlash Lite 1.4.0000 tentu harus tahu terlebih dahulu apa yang dimaksud dengan Bootable USB Windows agar tidak salah dalam memahami fungsi dari software yang satu ini. Jadi, Bootable USB windows adalah sebuah USB yang didalamnya terdapat master windows yang dapat digunakan untuk menginstall suatu laptop atau komputer menggunakan USB terutama Flashdisk. Seperti yang diketahui bahwa saat ini tidak jarang laptop atau komputer tidak memiliki CD/DVD Room sehingga menginstallnya harus menggunakan cara lain yaitu menggunakan Flashdisk, dan software yang bernama WinToFlash Lite ini berfungsi untuk membuat USB bootable Flashdisk Windows agar flashdisk tersebut dapat digunakan untuk menginstall windows di PC. Install Windows from bootable USB on any device. WinToFlash can create bootable USB with any modern Windows Desktop and Server family, 32 or 64 bits. Multiboot support. How about 5 different Windows versions, offline antivirus and recovery live cd on a single USB drive? Emergency recovery and Live USB – WinToFlash can create Live USB from about 90 LiveCD image. BIOS Upgrade – DOS on USB. Some motherboards requires old style DOS flashing programs, WinToFlash will create for you bootable USB with MS-DOS in a moment. ISO, ZIP, RAR. WinToFlash will read all popular container files, images and archives. No need to mount drive or unpack archive manually. Folder, CD or DVD is good source too. Experimenting with Windows Setup or Live USB? Don’t want to pack it to ISO/ZIP every time you test? Set the source of files to your folder and press start. FAT16, FAT32, NTFS in CHS and LBA addressing. Use FAT16 CHS in the advanced mode, if your motherboard fails to boot up USB drive with FAT32 Windows XP Setup. You have a choice for better compatibility and troubleshooting. Fine tine of all FAT options is at your service too! Set any size of partition you need. Some motherboards won’t boot until you use CHS addressing for partitions and file system. So, no, problem, WinToFlash can do this! Fair CHS addressing. It’s very important for bootable USB to be compatible with CHS addressing. With WinToFlash you have a choise how to calculate CHS. USB storage mode selection – HDD or FDD. Most motherboards can boot USB-HDDs, but some needs old USB-FDD mode. 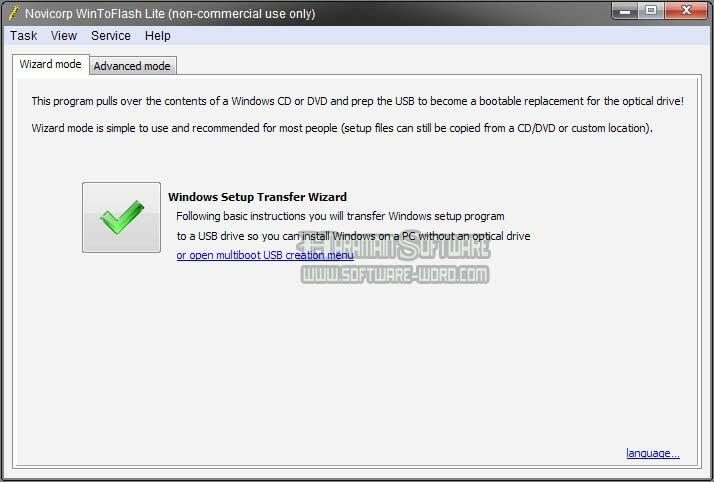 In WinToFlash you can chose what mode do you need for your bootble USB. Capacity limitations. It’s very hard today buy USB drive less than 4Gb in a store. But if you need 512 Mb USB drive to boot old DOS? WinToFlash will limit your bootable USB to any size you need. Different bootloaders. Of course, no more GRUB4DOS if you need non-standard bootloader. WinToFlash can install it automatically, just select GRUB on the boot loader page, if standard fails to load with your PC. UEFI Support. If you own new PC with modern UEFI instead of BIOS WinToFlash will create Bootable USB with all files you need to boot with UEFI. Profiles support. Save your bootable USB options to the file and load them up at any time you need. WinToFlash is portable. Unzip, start wintoflash.exe. No installers. Copy it to your “flash toolbox” if you are an administrator, it’s useful.